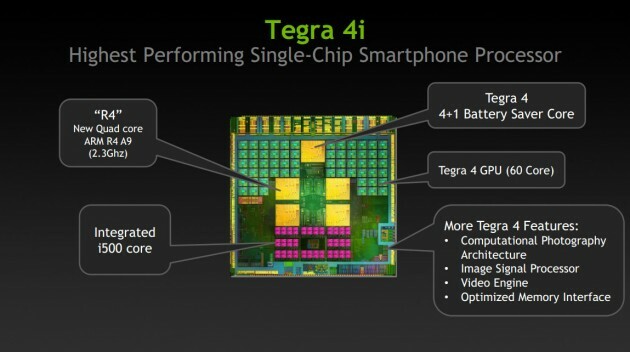 Nvidia just announced the Tegra 4i processor which got integrated LTE chip on processor SoC. This is really good news because we all know that having to run separate LTE chip increases the power consumption and decreases all over efficiency because of many constraints by having to transport all the communication data in and out from the SoC. When Nvidia announced the original Tegra 4 which I covered here it also didn’t included a integrated LTE chip but they have detailed i500 soft modem which OEM’s can integrate (separate chip) to Tegra 4 to enable LTE functionality. Don’t feel heart broken because Nvidia went with A9 architecture because R4 which is the latest iteration of A9 architecture is much faster than older A9’s such as Tegra 3 and don’t forget that Tegra 4i can be clocked at 2.3ghz per core giving us nice boost of single threaded applications and such. On press release Nvidia says that it expects to see designs of 4i will be out by end of 2013. While I think Tegra 4i is great, the end of 2013 timing just wont be good enough for Nvidia as the much anticipated designs such as Big.Little concept and Snapdragon S4 prime will be most likely out by then.